One of the photos above has dimensions. 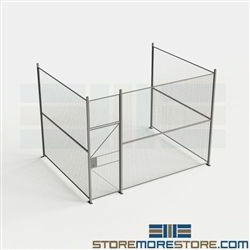 Tool crib cages with 4' doors are designed to create enclosures within your existing space for storing tools, servers, machinery, evidence, and more. The welded wire panels have a durable but simple design that requires fewer parts than standard partitions for quicker and easier installation and relocation. Contact us for special layouts. 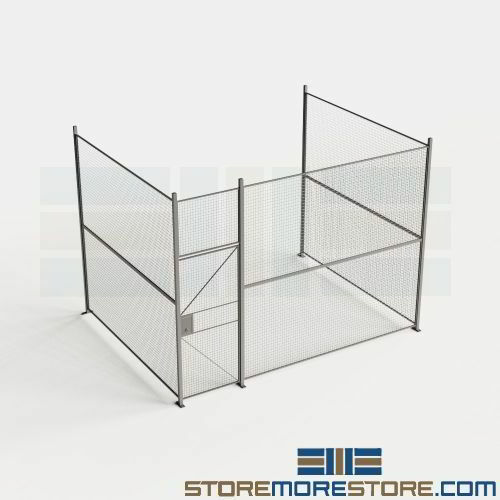 Wire partition panels have a durable and secure design that makes them ideal for use as tool cribs, server & colocation cages, evidence storage, equipment enclosures, holding cells, driver access cages, machine guarding, and DEA drug storage cages. Its welded construction requires fewer parts than standard partitions, making them easy to install, remove, or relocate at any time. The mesh also stays in place if you need to make cuts around obstructions. 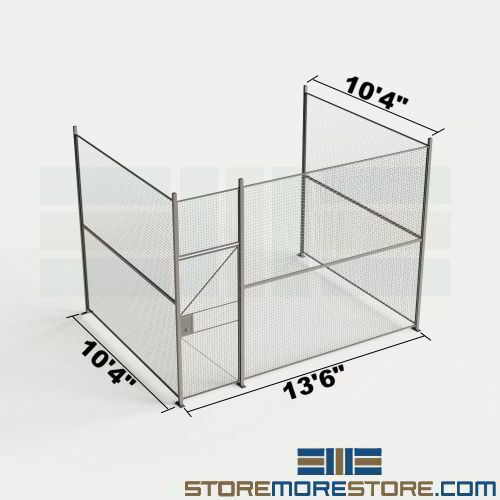 Panels: 10-gauge welded wire 2" x 2" square mesh panels (actual openings are 1-7/8") with 1-1/4" x 1-1/4" 13-gauge rolled form angle frame. Panels when attached to posts are 3-1/4" off the ground. Welded wire panels are easy to notch for around pipes and obstructions if required. Posts: Posts can be used in corners or straight runs. Posts project 2" above top of panel. Standard baseplates are 2" x 7" welded to the post with holes for anchors (baseplates extend out 2-1/2" on both sides of the post). Standard hole layout allows for 3-1/4" sweep space. Floor anchors are included. Hinged Doors: Universal construction works for left or right hand and inside or outside swing. Door is 3' wide by 7'-3 1/4" high with stiffeners and transom panel sized to match partition height. Door has three 4" x 1" 10-gauge tight pin hinges. Option 4' hinged doors are available upon request. Sliding Doors: Universal construction works for left/right hand inside/outside. Sliding doors are full height to match partition height. Overhead track with two 4-wheel trolleys and all hardware is included. Optional Adjustable Filler Panels: Adjustable solid sheet metal filler panels used to fill gaps between partitions and walls or between partitions. Filler panels adjust from 1" to 11". Available in 8' height and 10' height. Hardware: Includes 3/8" standard thread-grade two-plated fastening hardware. Utilizes the heaviest assembly hardware in the industry with bolts that are only accessible from inside. Floor Anchors: 3/8" wedge type floor anchors (included). Finish: Standard finish is gray acrylic enamel. Other colors available (call for quote and ship time) yellow, black, red, blue, orange, tan, and white.